Thinking about owning an atm machine? 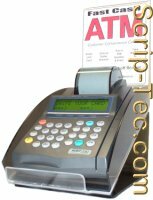 We've got Atm machines FOR SALE for Atm machine business opportunity, Atm machine franchise, Atm machine investments and investment opportunities. We are a wholesale atm machine supplier. Contact us TODAY! Sign-up TODAY, and start making money on each transaction! for the Custom Kiosks shown below, and on Processing Services. New machine package includes Standard Counter-top Kiosk with backing signage, power cord, phone cord, door stickers, hang down ceiling sign, window sign, complete user manual, quick reference guide, toll-free tech support, shipping, and optional paper supplies & lifetime machine replacement warranty (covers normal usage only). Our machines also come pre-programmed for easy plug-n-play set-up! New machine package includes Custom Counter-top Kiosk with lighted Topper, power cord, phone cord, door stickers, hang down ceiling sign, window sign, complete user manual, quick reference guide, toll-free tech support, shipping, and optional paper supplies & lifetime machine replacement warranty (covers normal usage only). Our machines also come pre-programmed for easy plug-n-play set-up! New machine package includes Custom Stand-up Kiosk with lighted Topper, power cord, phone cord, door stickers, hang down ceiling sign, window sign, complete user manual, quick reference guide, toll-free tech support, shipping, and optional paper supplies & lifetime machine replacement warranty (covers normal usage only). Our machines also come pre-programmed for easy plug-n-play set-up!